This chapter introduces the notion of operations and briefly describes sections dedicated to operations as well as operation specificities. 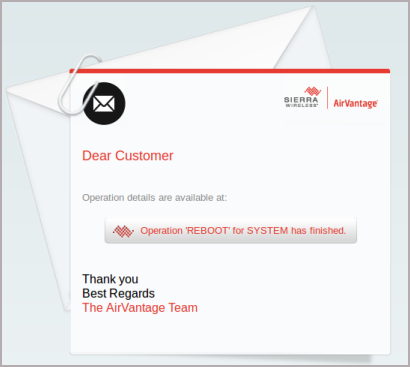 All actions performed on entities of the AirVantage Operating Portal generate operations. The different tasks of the operation are being created. The operation has been created with a scheduled process date and time. The operation is being processed. An operation is processed immediately after initialization. The operation has been processed. Can end either in failure, in success, or in aborted, or in a mix of those 3, if the operation includes several tasks. How to know the state of an operation? Operations can be reviewed in details in three dedicated Operations sections of the Inventory, Monitor and Develop activities, depending on whether they relate to an activity or another. Operation details can be reviewed by clicking on an operation in the list. The content of the operation details is split into two parts: a first part containing all the general information relevant to the Operation itself, and a second part including information specific to each entity (System, Gateway, Subscription, Application, Alert, …) involved in the Operation. A progress bar and a filter capability are also present in case of multi – entities operations, to give a high level progress information. The filter permits to easily spot an entity by searching in the search field, or filtering all entities for which operation failed or succeeded using State entry. Clicking on the entity of interest in the list of involved entities will reveal additional details about progress of the operation for this selected entity. Details can be an ERROR, a WARNING or an INFO message. An operation details is accessible from an URL formatted as: https://na.airvantage.net/operation?uid=. If an operation is set to send an e-mail upon operation completion, this link is displayed in the body of the notification mail. This is useful to quicly check the operation status. How to schedule an operation (at a given date, before a date, …)? or following a Request connection, depending on whether the server should try to connect to the device instead of waiting for next connection. 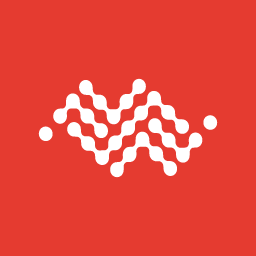 During communication with a device, the AirVantage waits for a reply from the device for a certain amount of time, usually few minutes (exact value depends on the type of the operation and on the protocol). In case there is no reply from the device, the operation ends in “timeout” error. How to apply a label based on the operation result? Labels can be applied on systems / subscriptions / applications or gateways via the operation results. 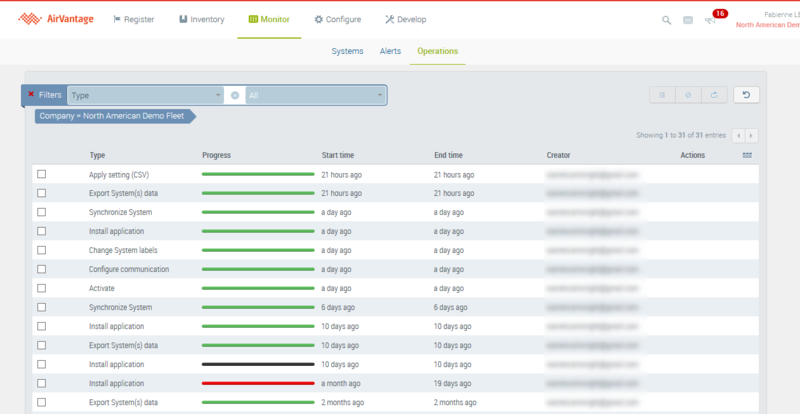 Click on any operation (finished or still in progress) in the Latest Operations widget (systems details page) or in any other operation list. The operation details is displayed. Click on the Apply Label command. The label can be applied for operations on success , failure/cancel or both. A default label is proposed and can be changed to a label of choice. 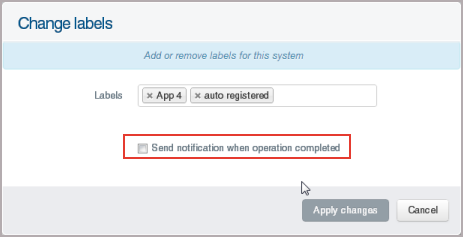 How to be notified when operation completes? If you decide to be notified of the operation result, you will receive an email including all operation details. How to abort an operation? An operation in status Initializing, Scheduled, or In Progress state can be aborted. 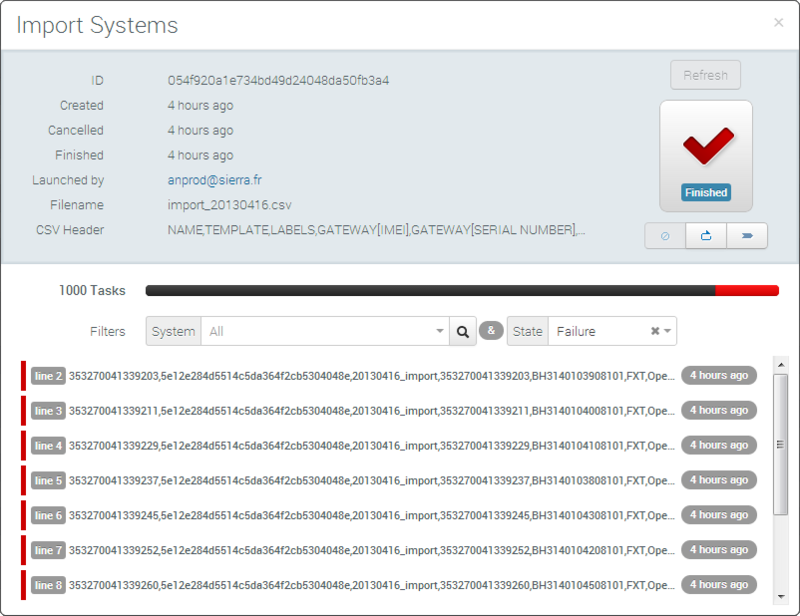 Click on an operation in progress in the Latest Operations widget (systems details page) or in any other operation list. The operation details is displayed. Click on the Abort command. Click Yes to confirm. An operation abortion is launched. The operation progress bar turns grey when aborted. For operations implying communication with a remote system, the cancel of an operation may occur while the remote system is processing the request. In that case, the operation will still appear as cancelled, while the device will pursue the requested task. An operation has failed and after a quick check you want to give it another chance? From the operation details screen, it is possible to retry an operation. The retry will be launched on all entities for which the previous operation has failed or been aborted. The parameters taken as entry will be the same as the previous operation. 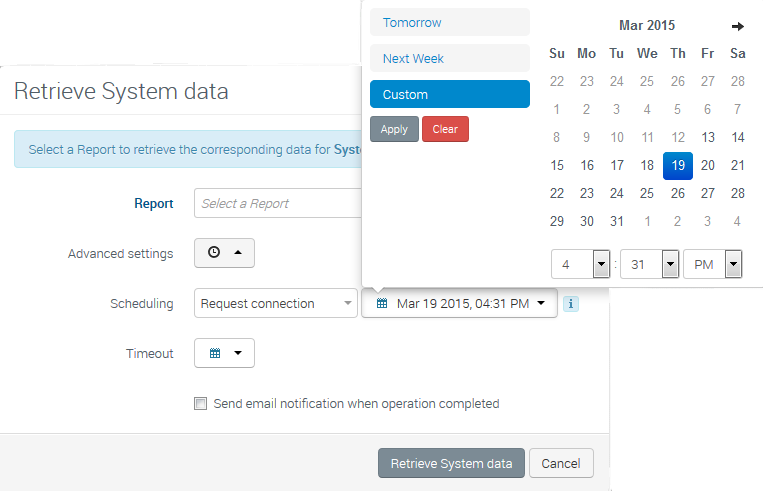 Same functionality is also available from the operations grid or operations notification popups. 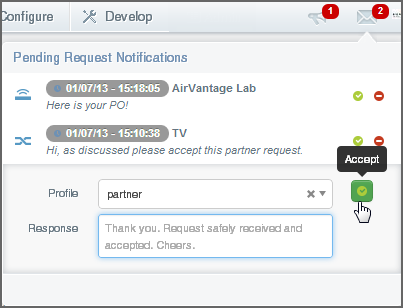 Only users with the proper profile and rights can view pending request notifications.